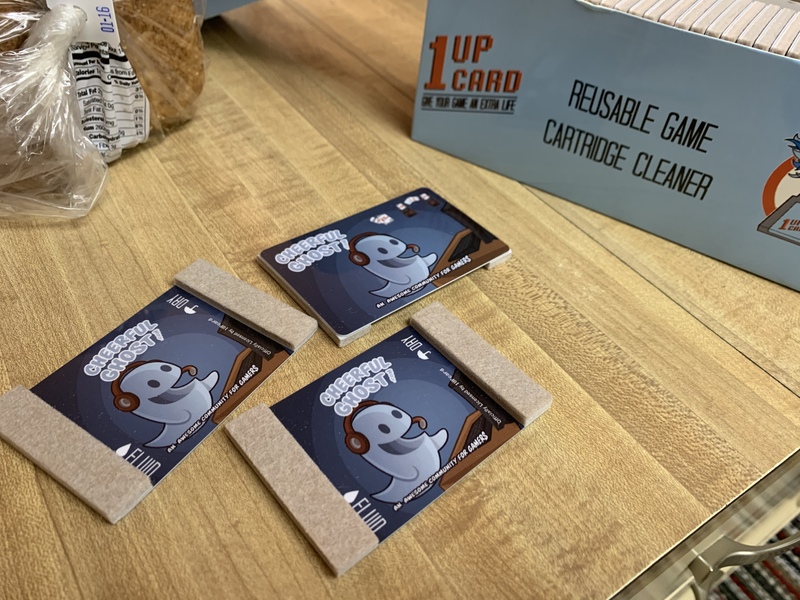 Cheerful Ghost Branded 1UP Cards And The Portland Video Game Swap Meet 2018! In Oregon we are all lucky to have the Portland Retro Game Expo which is a fun event in the later summer for everything awesome in retro games and trading. Cheerful Ghost has a booth each year, which is something you should check out if you haven't yet. In the new year the Video Game Swap Meet is held at the Portland Double Tree and put on by the Portland Retro Game Expo and The GameFather and I wanted to write a bit about the event and some of my pickups. Spoiler alert, Will got quite a few more games than I did. The Portland Retro Game Expo is a very large event with a wide reach including a huge free to play arcade, game tournaments, retro game vendors, toy collectables, geek swag (think Yeti style shirts) and various game creators and game sites and podcasts like Cheerful Ghost. The Video Game Swap Meet is more focused around vendors selling and trading games and it's a really focused one day event. I really enjoy it because it's easy to take in and go through each booth a few times to make sure you've picked up anything you want. The swap meet had a lot of people there but less folks than PRGE which is a nice change of pace. 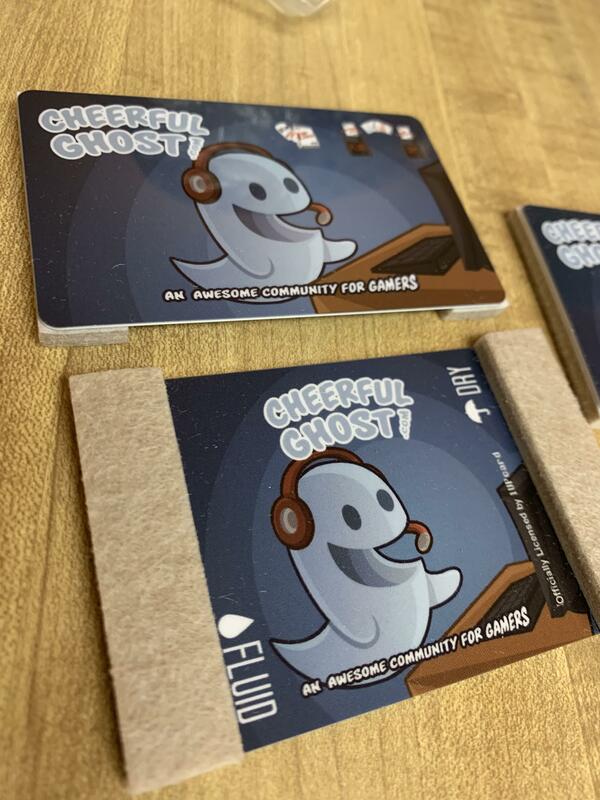 I wasn't coming to the Swap Meet with anything in mind to get, I really just like hanging out with the Retro community and I also wanted to handout some of our new Cheerful Ghost branded 1UP cards. If you don't know, 1UP cards are a great way to clean your old retro NES, SNES, Genesis, 64, etc carts without blowing into them. Think a simple two sided cleaning card that has no downside of spitting into your carts, which you should never do to clean them. I've seen branded 1UP cards in the wild and have wanted some Cheerful Ghost cards printed so I contacted 1UP and had some made up. If you want to see what they look like hit the image link below. Will and I were one of the first people in line and as such I was able to hand out the cards, some stickers and a podcast handout to the first 10 or so people easily. People seemed to dig the new 1UP cards so I'm going to do a similar giveaway at Portland Retro Game Expo this year as well as sell them at our booth. I'd like to get some Cheerful Ghost shirts printed this year too, but we'll see how it goes. As to the stuff I picked up this year I finally was able to round out my collection of Just Dance games on the Wii with the original Just Dance 2009 game. I've got the others and it's a fun series and one reason I still have my Wii hooked up to my TV. I also picked up two DS games in Plants VS Zombies and Zoo Tycoon. Both are PC ports that landed in various forms and I've only played a bit of Plants VS Zombies DS so far. I want to do a more formal review of Plants VS Zombies DS but i'd say if you were a fan of the game and wanted to collect a version of it on DS, get it. I aim to collect all the Zelda games and finally added Oracle of Ages and Seasons on Gameboy Color to my collection after finding them both for a good price. I also saw Link to the Past in box and in great shape but I think i'm going to save that pickup for this years Portland Retro Game Expo. It was fun to design these. Hagen, if you’re reading this, thanks for not collapsing your layers in the sticker PSD so we could re-tool it! I picked up no games. I don't know where Jon gets these crazy ideas.